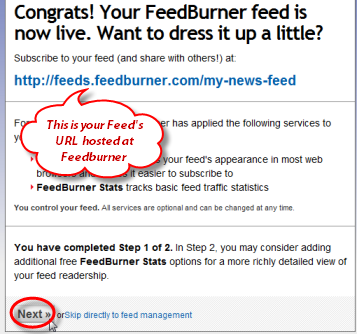 Now that you know the URL of your Joomla's RSS Feed you can easily submit it to FeedBurner, but before you do that make sure that you create a Google account. The email you registered your Google account. The password of your Google account. 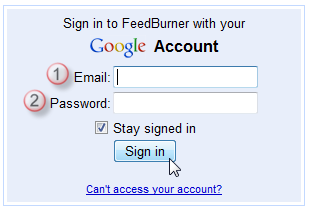 Last click on "Sign in" to login to FeedBurner. 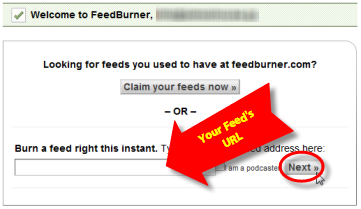 On the next screen you need to enter the URL of your RSS Feed (the one you took note of before) and then click on next. A title for your Feed, in our example "My News Feed". Then click on "Next" to continue. 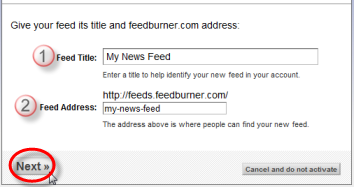 On the next screen FeedBurner informs you that your Feed was successfully burnt and shows you the URL of your Feed hosted at FeedBurner, in our example http://feeds.feedburner.com/my-news-feed. Then click on "Next" to continue.